Every board of reclaimed wood used in the making of our furniture is hand-picked for its character, features and heritage. We know our suppliers personally, and they share our values of social responsibility and sustainability. Our current supply is locally sourced, old­–growth fir from a 100+ year–old building torn down in Vancouver’s Gastown. 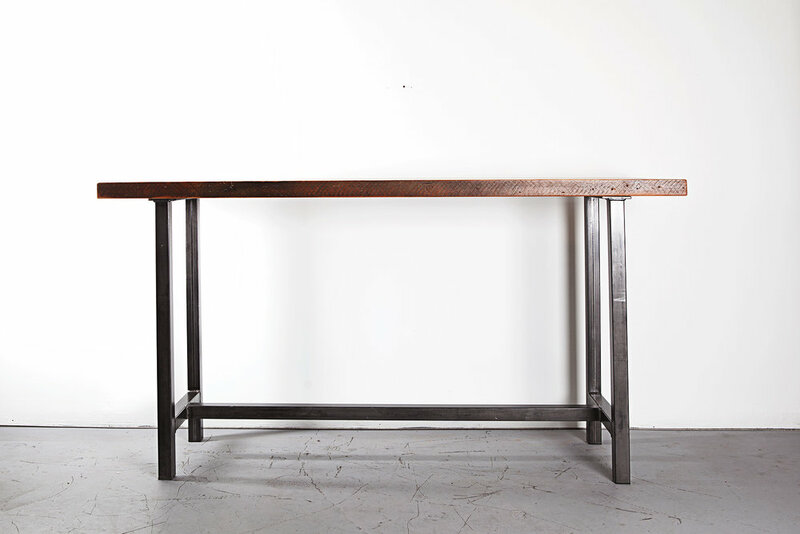 We found a beautiful pair of reclaimed cast iron 15-ton Benchmaster press legs. We knew they could hold their own weight and so much more once we built them a top. Indigo is not a colour normally associated with wood, however it looks extraordinary with open grained fir. Craig & Sheila were looking for the perfect dining room table to fit in their recently renovated century old home. It took five years to complete their dream home, Sheila later told us they spent almost two years looking for the right table and bench.